ParkGuell.es is not related to any official organism. Intellectual property and exploitation rights of all web images are reserved to Park Güell.es and Joan Perramon. No commercial use is permitted without permission. 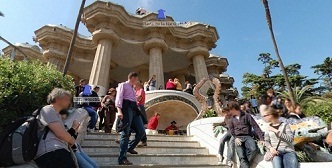 Located in the city of Barcelona, the ​​Park Guell is one of the most beautiful icons of the city. It's a work of Antoni Gaudí located in the upper part of Barcelona, which has wonderful views of the city. You can enjoy a fantastic green walk surrounded by a modernist works.